Sift flour and blend with baking powder, salt, sugar, butter, milk, vanilla, and eggs. Stir to blend. Beat at medium speed for 2 minutes (or 200 strokes by hand). Pour 2/3 of this batter into your G&S Square Cake Pan. Blend cooled chocolate and soda, which has been dissolved in the water. Add to the remaining batter. Beat for 1/2 minute. 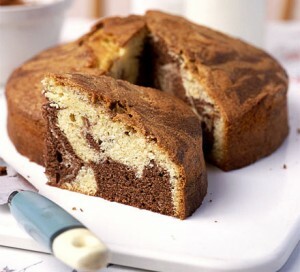 Pour chocolate batter over the light batter, then cut through with a knife 2 or 3 times for marble effect. Bake for 30 to 35 minutes until cake tests done. Frost, if desired.